Even churches where the kiddies have been persuaded to create an Easter Garden do not attempt a physical portrayal of the words in the Exsultet destructis vinculis mortis, Christus ab inferis victor ascendit. The most stupendous event in the history of the cosmos - the most terrible wonder in the elapse of time betwen the initial and final big bangs - is never actually attempted by artists or even described in words. The Lord's Resurrection is, as it were, wrapped in veils. Jesus' burial may be described; lightning and earthquakes may be mentioned; women and men meet the mysterious stranger in the garden or on the road to Emmaus; but no television camera, no recording historical pen, no purported eyewitness, intrudes into the darkness and mystery of that cave-tomb. No Gospel writer claims to discern a tremor beneath the winding-cloth, no chronicler pretends to be able to describe the aweful countenance of the One who was dead and en atomoi, in a moment, is alive. It is as if to do so would mar the unimaginable wonder and terror of such a ... did I call it an 'event'? I think that was a category error: what we are talking about is not in any cataphatic word-bag. No, for the Gospel writers it is as if even to try to imagine it is an unspeakable vulgarity. 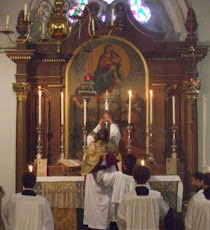 And the Church's liturgy is marked by the same awed reticence: in the Song of the Candle the deacon exclaims with fearful wonder: 'O Night truly blessed, who alone wast worthy to know the time and the hour'. The greater the miracle and the greater the wonder, then the more need for a veil to shield our eyes. S Thomas Aquinas, perhaps the greatest Christian thinker since S Paul, described what Christ did at the Last Supper as 'the mightiest miracle that he ever worked during his life on earth'. That same miracle is repeated every time that Mass is offered; at every Eucharist the stone is rolled from the darkness of the tomb; when the words of consecration 'This is my Body' are uttered, the Easter Lord who was dead and is alive walks out of eternity and comes among us; and the veil which prevents us from being consumed by such a wonder is the forms of bread and wine. The naked brightness of the divine reality would be too much for such as now we are. But as we kneel at the altar, every Mass is Easter and the Lord is the risen and invincible One and He whispers to each of us, as He whispered to Mary in the garden, the name He has given us; and for a moment the veil becomes wafer thin. "11. What the an­cients called a clever fighter is one who not only wins, but ex­cels in win­ning with ease. 12. Hence his vic­to­ries bring him nei­ther rep­u­ta­tion for wis­dom nor credit for courage." And then, of course, we are told to pray and do our good deeds in secret. It has often occurred to me that many the greatest saints have not been and probably never will be recognized in this life. It is not only miracles where the greatest are veiled, and they are not only veiled lest we see the face of God and die. The greatest things are often also the most difficult to perceive. Wonderful, Father. But taking advantage of this divine modesty and discretion, the "partisans of error", the modernists of our day like to ask this question: "Well, if there were a camera in the tomb, you don't think it would have recorded anything, do you?" they say this to insinuate or even boldly to suggest that the Resurrection was not physical, that He did not rise "in his human body", in "flesh and bones" (which they suggest is a lie). Yes, the Resurrection was hidden, it was unseen, but it was not in itself invisible. The dead body was visible. I argue that, in itself, the risen body would be and is visible, according to its nature. The Risen One, being all powerful, could control who saw Him and when and how they recognized Him. Or am I being excessively and crassly materialistic? This comment I will print and put in my missal for future reading, over and over again. Thank you. The Piero della Francesca of the Resurrection in San Sepulcro is worth making a special journey to see. And Dorothy L Sayers has an interesting discussion of how she formed a consistent picture to use in her radio play. For example, the rolling back of the stone could not have been to let the Body out, since the resurrected Christ could pass through barred doors without difficulty. But since this destroyed the evidence of the unbroken seals with grave clothes were left for inspection. Man born to be king, 316-7. Spitting: how, when, why, and where to do it. Clerical bigamy in Italy ... the Albenga files.